I have had so much fun this week! Before Christmas I found a fabuloso old post card in Seattle at my favorite Mexican folk art shop in the Pike Street Market. 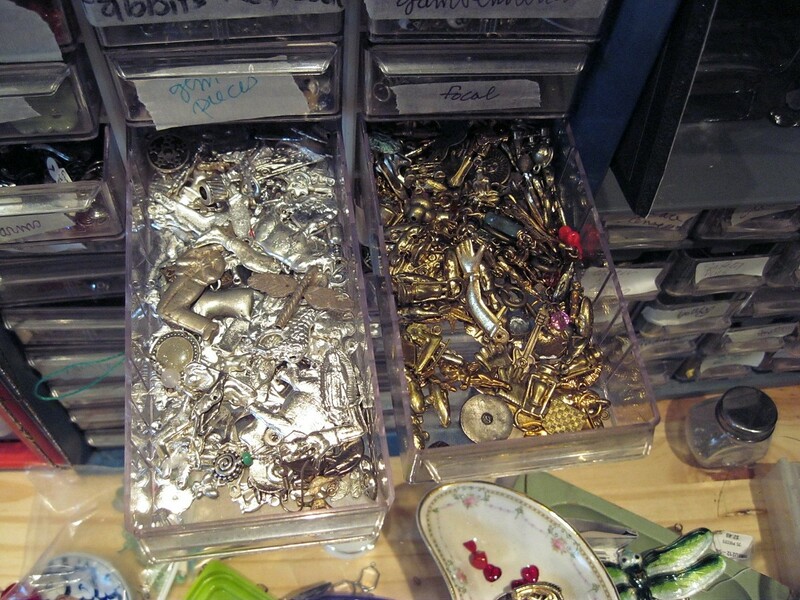 I love Milagros, which is the store’s name and also the name of the cool silver/pewter/tin charms that I love and collect at every opportunity. The store inspires me and makes me covet half of what is in it. I’m always happy to come home with something small and fun that gets the creative juices flowing. The card is actually scenes celebrating Dia de los Muertos, Day of the Dead, which is celebrated to show respect to ancestors round about halloween. My postcard shows six bony couples having fun and I thought it would make a great crossover for Valentine’s day. I adore black/white/red together too, which made this just about perfect. I scanned the card at a really high resolution, saved it as a jpeg (photo image) then resized and cropped every image before printing it on high quality WHITE paper. With papers, there is white, pretty white and blinding WHITE. I like the blinding white for printing photos to put under glass because the contrast adds a lot. I printed all the images, cut them out with my trusty scalpel and ruler and then put them carefully in glass sandwiches. I have so much glass around of all sizes and thicknesses that I could probably put the history of the world under glass in one way or another. All this glass is a side effect from framing my own stuff and being given junk frames by friends. 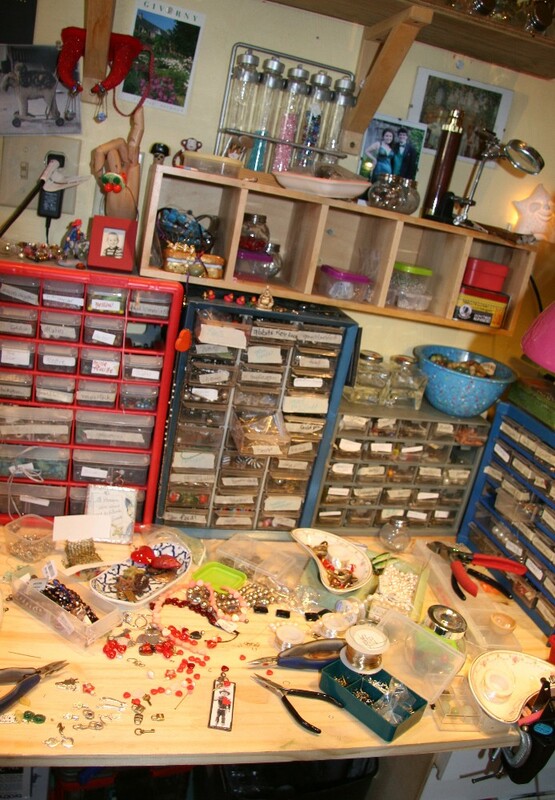 I can’t stand to throw out the glass, which explains the 2 foot thick stack of glass under my work table. If you intend to cut glass, invest in a really good glass cutter, actual cutting oil and running pliers. They make your life so much easier and you waste so much less glass, After cutting I always carefully sand the edges by hand or with my glass grinder as I don’t want to cut off a finger making art, I don’t even want to cut myself so sanding really works for me. 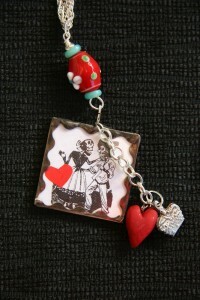 I will do a demo on cutting glass within the next few days but for now–on to the wearable Valentines! I foiled and leaded and soldered my folk art sandwiches after I cut out a little red heart and popped it into each side of each piece. I like oval rings on the top for strength and because they just look cooler. Then add a fun bead and chain, chain, chain, chain of ….oops, wrong reference. Each piece is unique because the top bead is different and the chain is different. I had fun going for silver, vintage brass, and even a brass bath tub chain. A lot of them have double chains for the added effect the chain weight gives visually. And the best part? They are soooo affordable! Mexican Valentine's two sided, each necklace is unique! Yours for $21 plus $5 shipping. Unique, six only, you get to choose which one you like until they are all gone…. I will be taking the pieces to Matter Gallery, but if you see one you love, let me know and its YOURS! Also as promised, a shot of the bone dishes I keep on my work table, pretty, great shape and they keep me organized to some extent. Click on the photo to see it up close and personal. 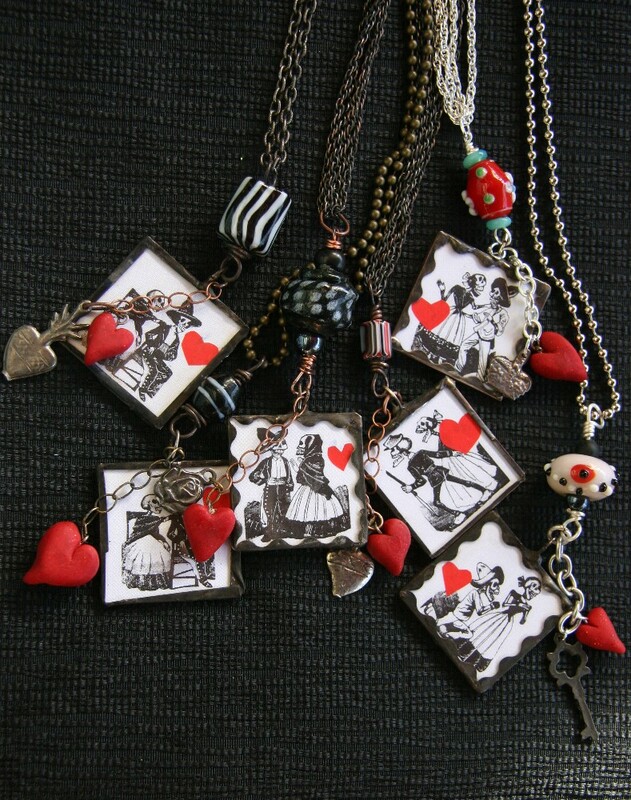 I’ve also been constructing a ton of adorable Valentine/love inspired earrings and will shoot those tomorrow. 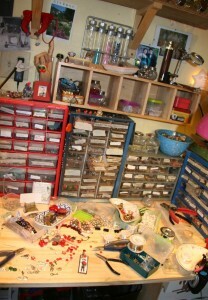 This is the work table in full construction mode, everything at my fingertips, love it. I found an awesome wire tree to hang the earrings on this week. Next project is to seat the tree in a pot of plaster for stability and turn it old vintage white, pictures to follow. 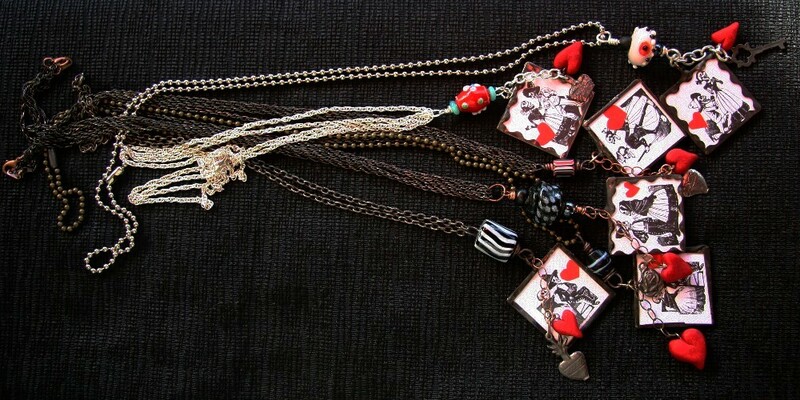 Hint: This is something you can do with those old black wire trinkets that were so hot a few years ago. Like I mentioned, a super productive week, a new necklace in the works in vintage brass, red hearts and pearls. It’s on the form now. It’s called “Eva” (pronounced Ava)for my beautiful soprano singing muse Eva G., who will be going off to Julliard, USC, UCLA or some equally prestigious performing arts school next year for college. I’m waiting for a few days of sunshine to photograph her in my mask collection soon, that will lots of fun, something to look forward to when winter gets me down. I do so love beautiful singing divas in my pictures…come on Spring! When I got distracted this week–Squirrel!–as in the movie, “Up”, I got out my polyclay and started playing. 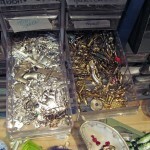 I want some new major beads and the best way to get what I want is to make it myself. I needed it for the hearts on the Mexican valentine’s anyway, great excuse, eh? I wound up making some copper green clay and popping it into my glorious new running rabbit chocolate mold. 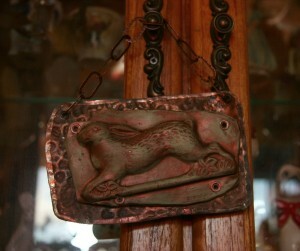 Here’s the result, after being altered and fastened to a piece of old tin with rivets and hung on chain. After posting this I’m back to the studio with lots of music and dogs and cats and dancing-yay! This week: the 1930’s which includes Fats Waller, Gershwin, Louis Armstrong, Fred Astaire and Cole Porter–with that group who wouldn’t dance! Earrings to come! Lessons in the studio to learn all this stuff yourself! Starting February 9th at 3:00 in the afternoon. Affordable fun, your chance to try something new before you invest heavily in supplies and tools. Take a craft for a test drive and make beautiful things. Contact me at runningrabbitstudio@gmail.com for information or questions or to purchase a Mexican Valentine. This entry was posted in Rabbit's Makes Art on January 20, 2011 by rox. I love these!!! LOVE LOVE LOVE!! !